Hello guys! For this post I have some freehand to share with you. I just got my new set of striper brushes and couldn't wait to try them out. First I applied Orly Pure Porcelain (the pink-ish off-white) as base color and then I used the brushes to add the rest of the colors, which were OPI Dim Sum Plum and China Glaze For Audrey. The 'black' you see is actually a very dark blue, China Glaze Ink, which comes in a bottle that already has a striper brush. The result looked alright, it just didn't really feel like 'me' :P Do you know that feeling? But it was fun to wear something different than I'm used to for once. What are your thoughts on this look? Awesome! I really like this colour combo and how these turned out!!! I really like the colours together. Fun and bright! I love it! But I would only use it as an accent nail, there is a bit too much going on with all of them like this, but I love the colours together! This is so cute! Love the color combination. I love this! I would wear this and enjoy it! I absolutely love how it looks. I really like the color combination! What a gorgeous combo. It looks like a wallpaper or fabric, lol. Very simple, but cute! I love the color combo! I love how each nail is unique and no two stripes are the same. so cool! I too love these! I have passed on Dim Sum because it's like the pink baby sister of my I Ate Berries in The Canneries. Not enough different - so I am going to try mine with that vs. Dim Sum. Watch...now next time I am at the beauty supply I am going to grab Dim Sum Plum!!! Cute idea and looks flawless! That's really cute! I love stripes in general, and I think the colors complement each other very nicely. I love those nails! The colours are beautiful. WOW! Want to see more like this! wow so cool!! reminds me of the circus!! I love this! Your colour combination is spot on and the overall effect is just amazing. I think this is a great look! Wow, those are pretty accurate freehand lines! Wish I had the skills to do it. And the color combination is nice, too! 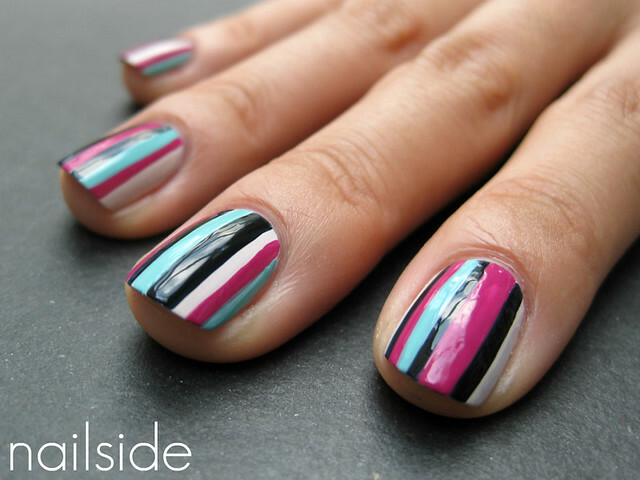 my thoughts are, this is stinkin' gorgeous and i want to recreate it today for my stripes mani for my 31 day challenge!! I absolutely love the design and colors! What nail stripe brushes do you use? Can I find them on Amazon? They're very cheap but work great and I've seen it listed many times by different sellers. Just came across your blog and love this manicure. Impressive free-hand striping! Colour combo is awesome! Hi there! I clean the brush by soaking it in nail polish remover for a few seconds and then I gently dab it on a cotton pad. If needed I'll repeat this till it's completely clean.